A slew of classic albums are being reissued on 180g vinyl, with replica first-pressing packaging and stunning half-speed remastering, undertaken at the legendary Abbey Road Studios in London. Bona fide rock classics such as The Rolling Stones' Exile On Main St, Cream’s Disraeli Gears and Free’s Fire And Water are being re-pressed alongside The Police’s iconic Ghost In The Machine, John Martyn’s folk-rock masterpiece Solid Air, and Simple Minds’ evergreen New Gold Dream. 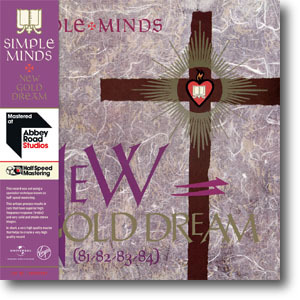 New Gold Dream (81,82,83,84) was one of the first six albums to receive the half-speed remastering process. " Arguably the finest vinyl pressings that these albums have ever received, the half-speed remastering, cut from the original master tapes, has resulted in “superior high frequency response (treble) and very solid and stable stereo images”, ensuring the best-quality sound available. " This half-speed remastered press was part of Universal's Half-Speed reissue mutiple artist programme, and wasn't part of a super deluxe box-set reissue. The project was announced in November 2015 and test pressings were dispatched in December 2015. This is an elaborate process whereby the source is played back at half its normal speed and the turntable on the disc cutting lathe is running at 16 2/3 R.P.M. Because both the source and the cut were running at half their "normal" speeds everything plays back at the right speed when the record is played at home. This album was cut from a high-resolution digital transfer from the original ½" analogue masters. The tapes were re-played on an Ampex ATR-102 fitted with custom extended bass response playback heads. Only minimal sympathetic equalisation was applied to the transfer to keep everything as pure as possible. Also, as this was an analogue, vinyl only high quality release, I did not apply any digital limiting. This is added to almost all digital releases to make them appear to be loud and is responsible for “the loudness war” and in almost every case is anything but natural and pure sounding. The biggest variable when cutting from tape is the replay machine. Every individual roller in the tape's path will have a direct effect on the quality of the audio emanating from the machine. 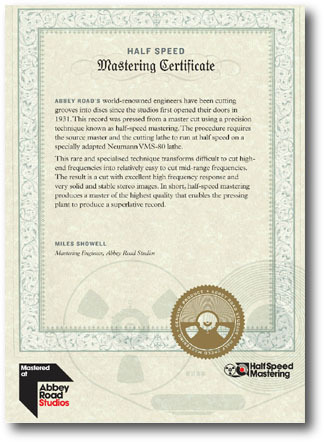 In addition to this, there is the issue of the sub 30Hz low-frequency roll off on an advance head disc-cutting tape machine which in effect will come into play at 60 Hz when running at half speed. In addition to this, there are also some unpredictable frequency anomalies in the 35-38 Hz region with analogue tape that will double up at half speed. These are all problems if you want to hear as originally intended the lowest register of the bass end on a recording. There is also the lesser potential problem of tape weave that effectively increases at lower speeds and leads to less high frequency stability and the possibility of minor azimuth errors. Even if these problems could be overcome, this is quite a long album and the masters were recorded on ½" tape running at 30 inches per second. The master reels are 14" in diameter and are just too big to fit onto a Studer A80 advance head replay machine. Neither Studer nor anyone else made a machine that could be used to play 14" reels and have an advance head for all analogue disc cutting. Even when this album was originally cut in 1982 it was played on an Ampex ATR-102 feeding into a digital delay. The advantage I have now is that digital converters are greatly improved over what was available 34 years ago. Finally, analogue tape becomes degraded with each pass over the replay heads. These tapes are getting old and it is no longer considered good practice to play and play and play precious old original masters for fear of damage and general wear and tear. Far better, then, to eliminate the variable of the reply machine and to minimise wear of the master by capturing the music digitally at very high resolution using professional converters locked down with stable external word-clocks. I can completely understand the reasons for the concerns that some people have when cutting classic albums from digital sources. Historically, there have been some horrible digital transfers used as a vinyl cutting source. This has absolutely not been the case with this series. Micro-management of the audio and attention to detail has been the order of the day. Abbey Road has striven to eliminate any digital weaknesses from the signal path in all the rooms in the building. Therefore to capture to high resolution digital from a well maintained Ampex ATR-102 with extended bass heads is a far superior working method in my opinion. Miles also clarified the specifics for this release: " This album was cut from a high-resolution digital transfer from the original ½" analogue masters. The tapes were re-played on an Ampex ATR- 102 fitted with custom extended bass response playback heads. Only minimal sympathetic equalisation was applied to the transfer to keep everything as pure as possible. Also, as this was an analogue, vinyl only high quality release, I did not apply any digital limiting. This is added to almost all digital releases to make them appear to be loud and is responsible for "the loudness war" and in almost every case is anything but natural and pure sounding. " The packaging was designed to be the same as the original 1982 UK pressing: therefore artwork for the The Vinyl Collection (79,84) was used with catalogue numbers and bar-codes changed accordingly. It was based on the first UK pressing so the gold inner sleeve was reproduced. A new obi-strip, certificate of authenticity and download code were included as part of the package. The records were mastered by Miles and he signed the laquer so his name appeares with the matrix number on the record.